Check out our calendar and come sing with us at posted events. Please read the following FAQ's and then subscribe to our site through the form below. We will email you news calendar updates. You can also go to the Contact Us page to offer Occuply Wall Street related songs and links. We'd like to get to know our subscribers, particularly your musical interests, and your ride sharing needs/capabilities. Knowledge is power! Needless to say, nobody's gonna try to sell you pharmaceuticals from our list. Q: Can I attend a rehearsal? A: We don't have rehearsals, just show up and sing. We provide songbooks for your use. We sing familiar songs and parodies with familiar tunes. Q: What if I can't sing? A: If you can talk, you can sing. Forget what your third grade music teacher told you! 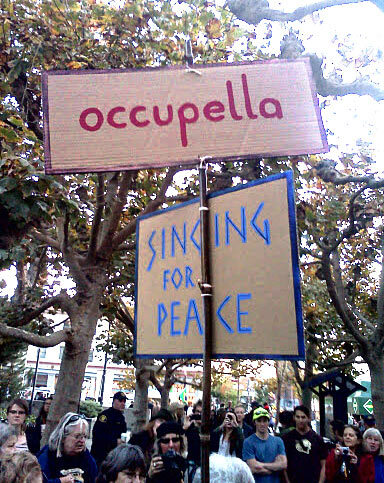 Q: Do I have to be a musician to join an Occupella action? A: No, you just have to enjoy singing. Of course, if you play an instrument or can make up a harmony part, so much the better! Let us know about your special talents on the subscription form. Q: Okay, but I really can't sing. How else can I contribute? A: We can always use people to play rhythm instruments, schlep cases and equipment, hold our sign, pass out leaflets, talk to the crowds, serve as a monitor on marches, etc. We'd also like photos and video of our events. Q: Can you help me with ride sharing? A: If you give your permission in the form, we will share your email and ride sharing info with other subscribers. We encourage you to travel green and in good company. Ok to share my email and rideshare info with other suscribers. Get involved! Subscribe to the Occupella site for news, resource updates and ride-sharing.